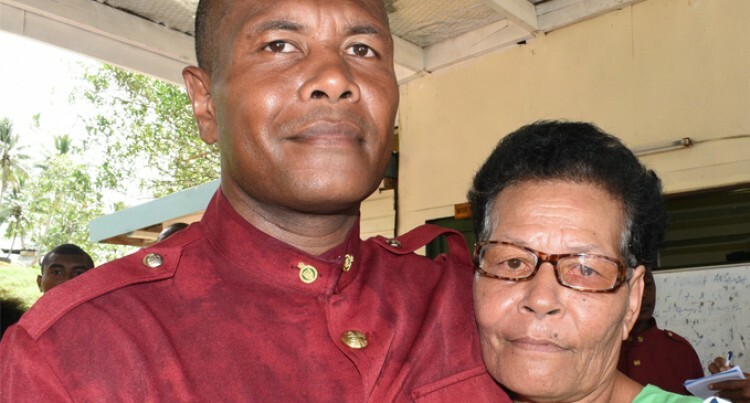 The recipient of the Baton of Honour and the Commis­sioner’s Trophy, Eparama Ravulo, 36, saluted his late father Jone Ravulo after he received his trophies. “My father died a day after my first day of recruitment and I sa­lute him for his advice when I left our home at Tacirua. I wish he was here today,” he said after the cadet passing-out parade yesterday at Naboro. He said his father had supported him when he left his work at the Ministry of Infrastructure and Transport to join the Fiji Correc­tions Service. “I’ll never regret my decision, but I will continue to work hard and look after my mother and my fam­ily,” he said. The 14 weeks of training, he said, was tough, but he had learned a lot. Mr Ravulo’s mother, Arieta Ravu­lo, 59, was equally happy and proud of her son’s achievement. “I only wish his father was alive to see him today. His last advice to my son when he left home for Naboro was – ‘That’s your choice, do your best. I support you and may the good Lord be with you’,” she said. Mr Ravulo is the second eldest in the family and hails from Caka­udrove, Vanua Levu.